Looking back at the winter of 2014-2015, conditions here in the northeastern United States were exceptionally cold and snowy. Globally, however, it was a record warm season! According to a recent report from NOAA’s National Climatic Data Center, the meteorological winter of 2015 (December, January, and February) was the warmest winter ever recorded on this planet. Earth’s combined average temperature for the season – over both land and sea surfaces – was 55.22°F. That is 1.42°F above the 20th century average. It surpassed the previous record set in the winter of 2006-07 by 0.07°F. Rising ocean temperatures, according to NOAA, helped fuel the season’s record warmth. Between December and February, the average global ocean surface temperature was 61.67°F, which is 0.97°F above average and the third highest ever recorded for the three month period. In the contiguous United States, this past winter was the 19th warmest on record with an average temperature of 34.3°F. That is 2.1°F. above the 20th century average. NOAA says the record warmth in the West outweighed the cold in the East. While the Earth’s atmosphere and oceans are warming overall, this winter’s temperature anomalies (both above and below average) highlight the fact that climate change is a complex global phenomenon that involves much more than what is happening in our own backyards. Year to date, 2015 is off to a record warm start. Global temperature records date back to 1880. Today is World Meteorological Day, which commemorates the establishment of the UN’s World Meteorological Organization (WMO) in 1950. Each year, the agency celebrates with a different theme. 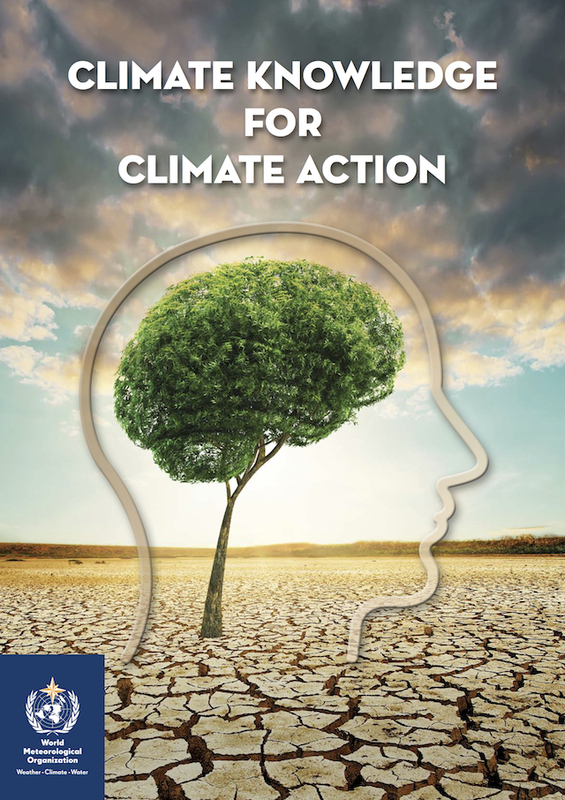 This year, it is “Climate Knowledge for Climate Action.” To learn more, visit the WMO website. 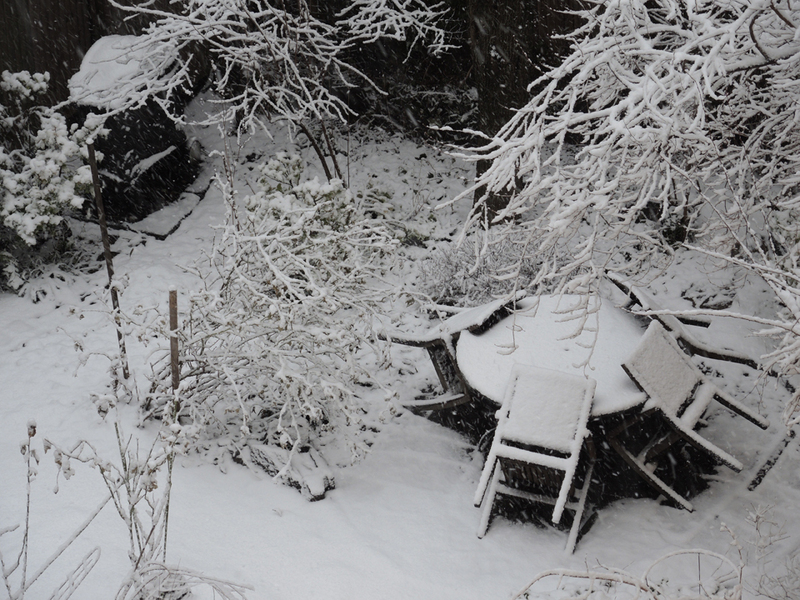 Spring got off to a cold a snowy start in New York City this year. The high temperature on the Equinox was 38°F, which is 13°F below average. The first day of the new season also brought snowfall to the Big Apple with 4.5 inches accumulating in Central Park. Month to date, the city has measured 18.6 inches of snow. March, on average, typically brings NYC a modest overall total of 3.9 inches. Snow falling on the Spring Equinox in NYC, March 20th at 6:45PM. Image Credit: The Weather Gamut. Today is the Vernal Equinox, the first day of spring in the northern hemisphere. The new season officially begins at 22:45 UTC, which is 6:45 pm Eastern Daylight Time. The astronomical seasons are a product of the tilt of the Earth’s axis – a 23.5° angle – and the movement of the planet around the sun. 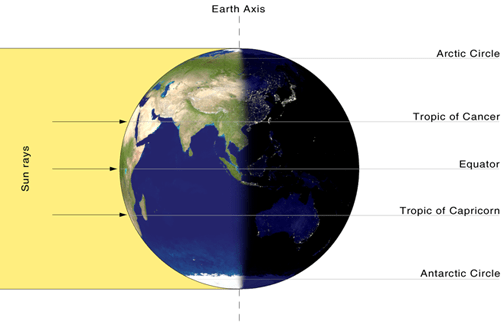 Today, as spring begins, the Earth’s axis is tilted neither toward nor away from the sun. This position distributes the sun’s energy equally between the northern and southern hemispheres. Since the winter solstice in December, the arc of the sun’s daily passage across our sky has been moving northward and daylight hours have been increasing. Today, the sun appears directly overhead at the equator and we have approximately equal hours of day and night. 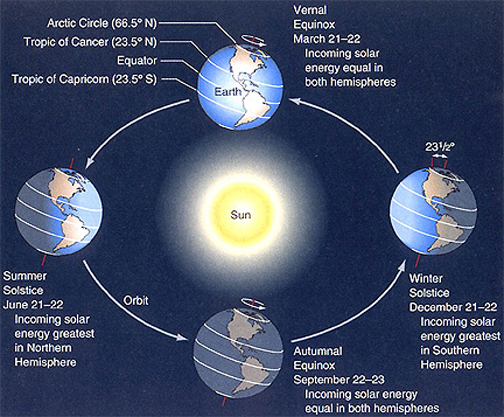 The word “equinox” is derived from Latin and means “equal night”. As a transitional season, spring is a time when the chill of winter fades away and the warmth of summer gradually returns. The largest increase in average daily temperature, however, usually lags the equinox by a few weeks. Temperatures around the globe soared last month. In fact, February 2015 was the second warmest February ever recorded for the entire planet. According to a report released by NOAA’s National Climatic Data Center, Earth’s combined average temperature for the month – over both land and sea surfaces – was 55.38°F. That is 1.48°F above the 20th century average. The warmest February on record occurred in 1998, when the temperature was 1.55°F above average and El Niño conditions were in place. For those living in the northeastern United States, this news may come as a bit of surprise. Many cities in the region experienced a frigid February this year. Here in New York City, it was the 3rd coldest on record. But, this difference in regional and global conditions highlights the fact that climate change is a complex phenomenon that involves much more than what is happening in our own backyards. Climate change is a complex scientific subject and there are a plethora of data-rich reports that detail its diverse impacts. Not everyone, however, responds to facts and figures or charts and graphs. That is why art can help broaden the public conversation and help create new pathways to understanding this critical issue. This Friday, I will be giving a presentation on the “Art and Science of Climate Change” at the 52nd National SPE Conference in New Orleans, Louisiana. My talk will cover both the basic science of climate change and explore how artists from around the globe have been responding to its various impacts and possible solutions. Record cold and snowy conditions have dominated the weather in the eastern US this winter. The western part of the country, however, has been exceptionally warm and dry. That includes Alaska, where the famous Iditarod Dog Sled Race got underway today. 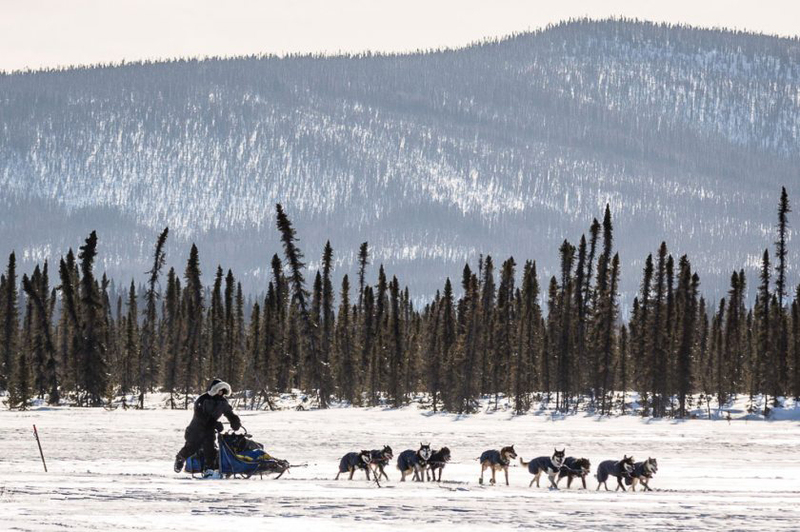 Due to a lack of snow, this year’s Iditarod had to be moved north 225 miles from its traditional starting point in Anchorage, AK to Fairbanks, AK. In a typical winter season, the city of Anchorage collects 60 inches of snow. So far this year, they have only received 20 inches. Meteorologists at the NWS office in Anchorage attribute Alaska’s unseasonably warm winter and its dearth of snow to a highly amplified jet stream, which allowed warmer Pacific air to dominate the region. Above average sea surface temperatures along the coastline of this country’s northern most state also contributed to its unusually mild conditions. Ending in Nome, AK, the annual race spans 1000 miles of arctic tundra and commemorates the journey made by dogsledders in 1925 to deliver medical supplies for a diphtheria outbreak in that city. This year was the second time in the event’s 43-year competitive history that the starting point had to be moved because of poor snow conditions. The last time was in 2003. Its official! NOAA has announced that an El Niño event is underway in the Pacific Ocean. But what, you may wonder, is an El Niño and how will it impact weather in the US? El Niño is the warm phase of the larger El Niño-Southern Oscillation, known as ENSO. Developing every 3 to 7 years, it is a naturally occurring oceanic-atmospheric coupled phenomenon that influences weather around the globe. 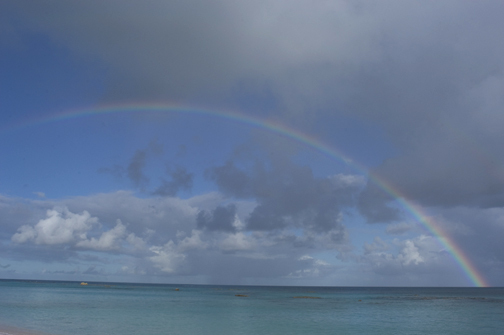 To detect its presence, scientists monitor the Oceanic Niño Index (ONI). This index is based on sea surface temperature anomalies in a rectangular region of the tropical Pacific between 5°N and 5°S latitude and from 120°W to 170°W longitude. When sea surface temperature anomalies in this region exceed +0.5°C, a weak El Nino is present. When they reach +1°C, it is considered a moderate El Niño, and when they go above +1.5°C it is classified as a strong El Niño event. But warming ocean temperatures are only half the story. There also needs to be a corresponding change in the atmosphere for an El Niño event to be declared. Specifically, there needs to be a weakening of the east-to-west flow of the Trade Winds and a change in tropical rainfall patterns. Influencing the position of the polar and sub-tropical jet streams, El Niño is most noticeable during autumn and winter. In the US, its impacts typically include wetter than average conditions in California and most of the southern states while drier than average conditions settle across the Ohio Valley, Great Lakes, and northern Rockies. In terms of temperature, the southwest and southern plains tend to be cooler than average while the northern tier of the country is generally warmer than average. Since every El Niño is different, it is important to remember that none of the regional impacts listed above are guaranteed. We will have to wait and see how this newest El Niño event plays outs.